Two obvious things are involved in the search for alien life, and both are based on evolutionary ideas. First, it would make evolutionists who pushed the origin of life problem off our planet feel vindicated because they would assume that life originated by chance "out there". Second, they could validate the huge expenditure of money over the years in their search. Of course, there are astronomical problems involved in detecting signals from space since they would take a very long time to get here. Then there would be the difficulty of deciphering the signals as well. Some of us think that perhaps it is not such a good idea to make contact with a "more highly evolved" life form. 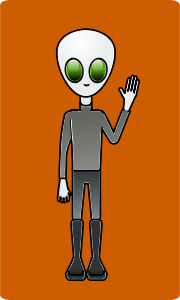 Others believe that there are no aliens because of theological reasons. Of course, that does not stop evolutionists from grossly misrepresenting the positions of some Christians or from using convoluted "reasoning" to defend their dishonesty. EDIT: I did an article on the logical fallacy of arguing from silence, here. One of the characters that provided me with a good example of that was kind enough to do it again regarding this very post. The discovery of exoplanets has rocket fueled the desire to find space aliens. However, the exoplanets are not cooperating. In fact, their existence is giving further difficulties to the already-failed favorite planet formation concept, and supports the creationist perspective. Even if a planet could be found that may have the necessary conditions to support life, they are not the conditions that can give rise to life in the first place. So, that problem remains. Quite a bit of money is being spent on metaphysical speculations dressed up as science. With lofty words about humanity’s future, NASA promoters discussed the hope of discovering life on other planets at a recent meeting in NASA headquarters in Washington. Despite billions of dollars spent on the decades-long search and the fact that not one shred of distant life evidence has been found, NASA continues to suggest that life might really be out there and that its discovery is within reach. Does scientific evidence really justify this expensive search for distant life? If not, what’s the driving force behind this program? The hope of discovering life in outer space dangles at the end of the long and costly stick, and its elusive carrot takes the form of life-friendly planets in distant star systems. The Kepler space telescope has helped astronomers verify over 1,700 “exoplanets” out of an ever-growing pool of more than 5,000 candidates. These findings almost certainly help fuel NASA’s plans to launch the Transiting Exoplanet Surveying Satellite in 2017, the James Webb Space Telescope in 2018, and others later on—all looking for distant signs of life. To read the rest, click on "NASA's Far-Out Search for Life".